ROME, Jun 23 2017 (IPS) - Soils are polluted due mostly to human activities that leave excess chemicals in soils used to grow food, the United Nations reports. The issue took centre stage at the Fifth Plenary Assembly (PA) of the Global Soil Partnership (GSP) held at FAO headquarters in Rome this week. 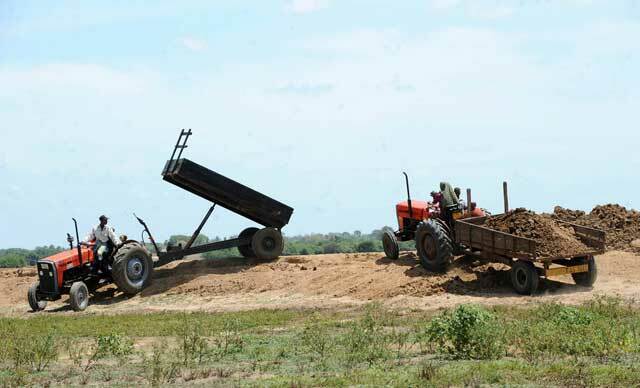 “Soil pollution is an emerging problem, but, because it comes in so many forms, the only way we can reduce knowledge gaps and promote sustainable soil management is to intensify global collaboration and build reliable scientific evidence,” said Ronald Vargas, a FAO soils officer and Secretary of the GSP. “Combating soil pollution and pursuing sustainable soil management is essential for addressing climate change,” said for his part Rattan Lal, President of the International Union of Soil Sciences, in his keynote address to the Plenary Assembly. Tackling human-caused problems through sustainable practices will mean “more change will happen between now and 2050 than during the 12 millennia since the onset of agriculture,” he added. The Plenary Assembly endorsed three new initiatives aimed at facilitating information exchange: the Global Soil Information System; the Global Network of Soil Laboratories, set up to coordinate and standardize measurement across countries; and the International Network of Black Soils, launched to increase knowledge about the world’s most fertile agricultural soils, which are also known for their high carbon content. Around one-third of the world’s soils are degraded, due mostly to unsustainable soil management practices. Tens of billions of tonnes of soil are lost to farming each year and one cause is soil pollution, which in some countries affects as much as one-fifth of all croplands, the UN specialised agency reports. The term soil pollution refers to the presence in soils of chemicals that are either out of place or at higher-than-normal concentrations. Such contamination may be produced by mining and industrial activity or by sewer and waste mismanagement. In some cases, FAO adds, pollutants are spread over large areas by wind and rain. Agricultural inputs such as fertilizers, herbicides and pesticides – and even antibiotics contained in animal manure – are also major potential pollutants and pose special challenges due to the fast-changing chemical formulas employed. The diversity of contaminants and soil types, and the ways they interact, make soil surveys to identify dangers difficult and expensive, according to FAO. Although commonly referred to in national soil classifications, “black soils” are far from uniform. The new International Network of Black Soils defines them as containing at least 25 centimetres of humus and with soil organic carbon content above 2 per cent; by this definition they cover about 916 million hectares, or 7 per cent of the world’s ice-free land surface. Around one-quarter of black soils are the classic “Chernozem” type, with a humus layer of more than 1 metre; these are found in the breadbasket steppe regions of Eastern Europe and Central Asia and in the former prairies of North America, the UN agency adds. The International Network of Black Soils aims to promote the conservation and long-term productivity of black soils by producing analytic reports and serving as a platform for knowledge sharing and technical cooperation.